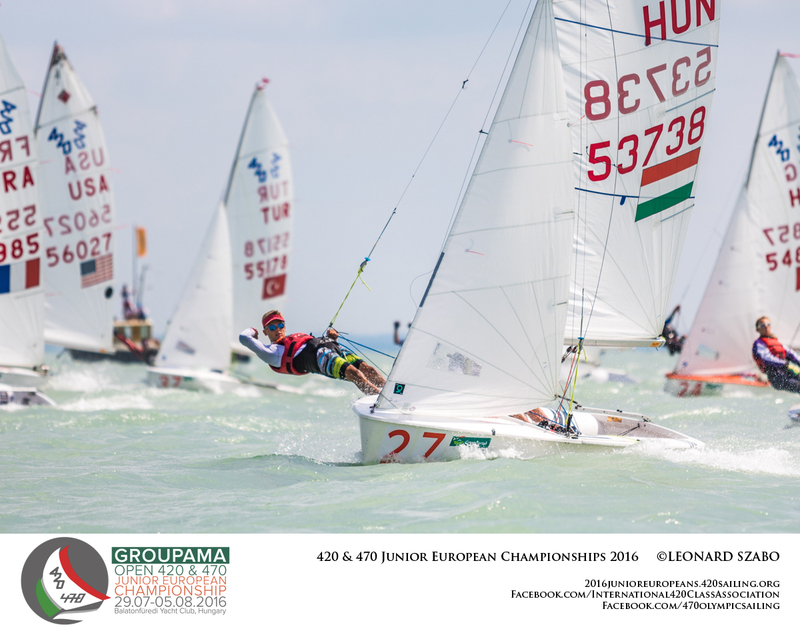 Stunning race conditions on day 2 at the 420 Junior Europeans delivered another full programme, with three races for the 420 Open and U17 fleets, and two for each of the 470 Men and 470 Women. 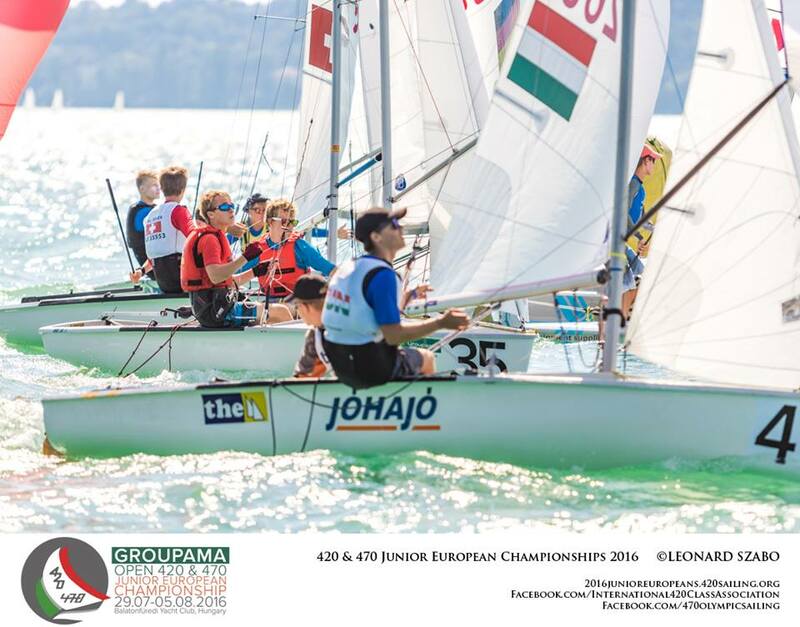 In complete contrast to the usual light winds which float across Lake Balaton in the Summer months, race day 2 again delivered a perfect breeze. More stable wins today meant success on the race track was measured by boat speed. You had to be in the 14-15 knot breeze and in phase with the shifts to stay ahead. As the shifts got bigger, any hope of staying in the race was all about staying focused and reading shifts with precision. Racing here on Eastern Europe’s largest lake is spectacular, with Lake Balaton so far guaranteeing azure waters, blue sky and temperatures well into the 20s. On equal points going into today’s two races, Malte Winkel/Matti Cipra (GER) and Giacamo Ferrari/Giulio Calabro (ITA) end the day still locked in tiebreak. A disappointing UFD penalty in the opening race 3 for being over the line early was resurrected by a win in race 5 for the German pair. Ready and waiting to jump into pole position, the Italians are one of only two teams to so far count all top 10 finishes, alongside third placed David Charles/Alex Charles (ESP). “Today the wind was good, although very shifty. We are placed well for the coming days and only are counting a 4th place as our discard. Tomorrow, we start gold fleet and we are looking good," said Ferrari. The forty-nine boat 470 Men fleet has now finished their 5-race qualification series and advance to final series, gold and silver fleet racing. The top 25 boats in gold fleet and are still in the hunt for a place in Friday’s medal race and shot at the Championship title, with the other 24 boats in silver fleet. Series leaders Benedetta di Salle/Alessandra Dubbini (ITA) continued yesterday’s run of form, scoring a 3rd in the opening race 4 of the day, but chose the wrong side of the track in the first upwind of race 5 to finish in 16th place. Counting this as their discard, the Italians maintain their lead. 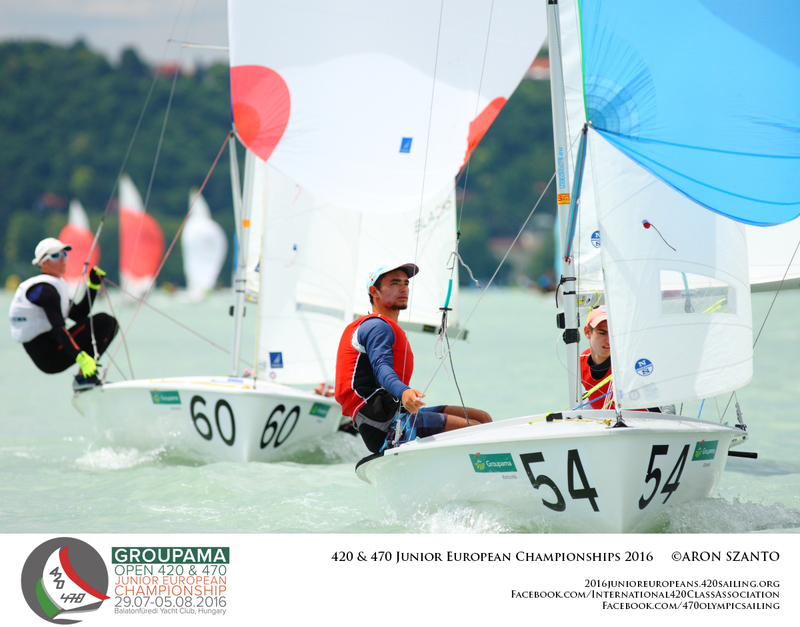 The Di Salle/ Dubbini partnership know their way around a race track, counting the 2015 470 Junior World Championship title amongst their top performances. 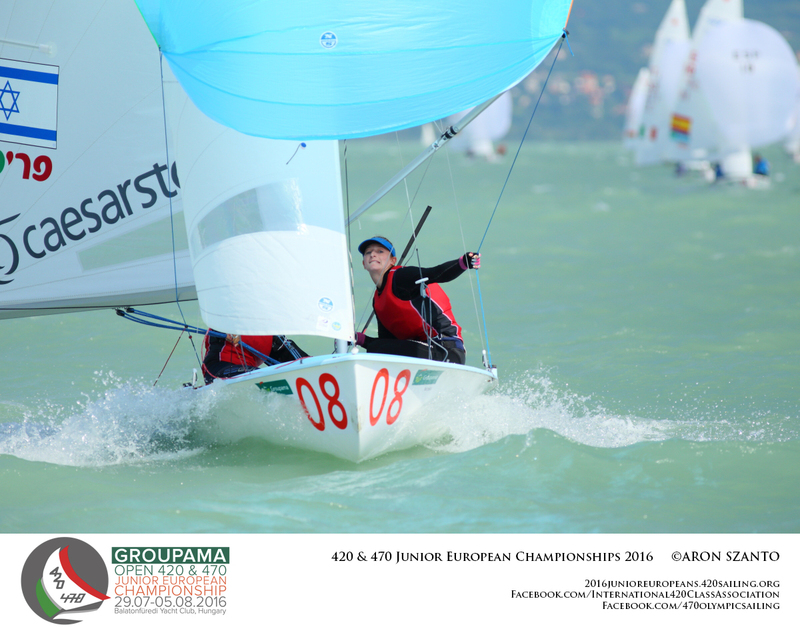 Di Salle also has plentiful honours in other partnerships, including winning the 2013 420 Open Junior European Championships, and 2012 ISAF Youth Worlds in the 420. 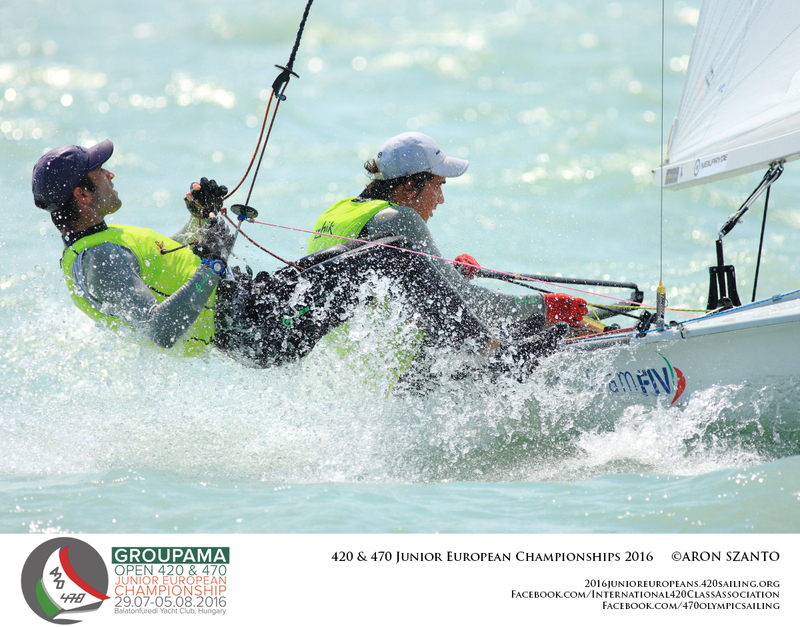 A leap to the front of the fleet from Germany’s Frederike Loewe/Anna Markfort from back to back wins, gives them a helpful climb up the leaderboard to 2nd overall, 6 points off the leaders. The pair have been stretching their legs around the front of the pack for a while, waiting to pounce on wins, and today was certainly a career benchmark. 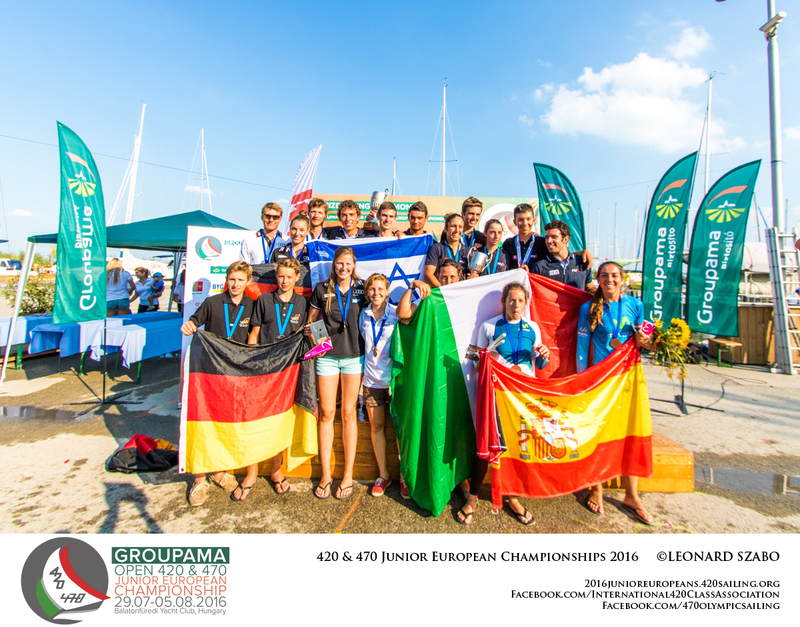 “We didn’t win a race at the 2016 Junior Worlds in Kiel and we can’t remember ever winning a race back to back. So it’s pretty cool,” smiled Markfort. “We are feeling really good. We were lucky to be at the top mark at the right time and then we gained places. Israel’s Noya Bar-Am/Stav Brokman shift up to third. New faces at the front of the 420 Open leaderboard as Switzerland’s Maxime Bachelin/Arno De Planta claim two race wins and a second to leapfrog ahead of overnight leaders Telis Athanasopulos Yogo/Dimitris Tassios (GRE), who drop to second. The race track was a master class in hunting out pressure and reading the shifts. “For us it was a very good day, and I hope we can stay in this position all week," said Bachelin. They have been competing together for around 18 months. 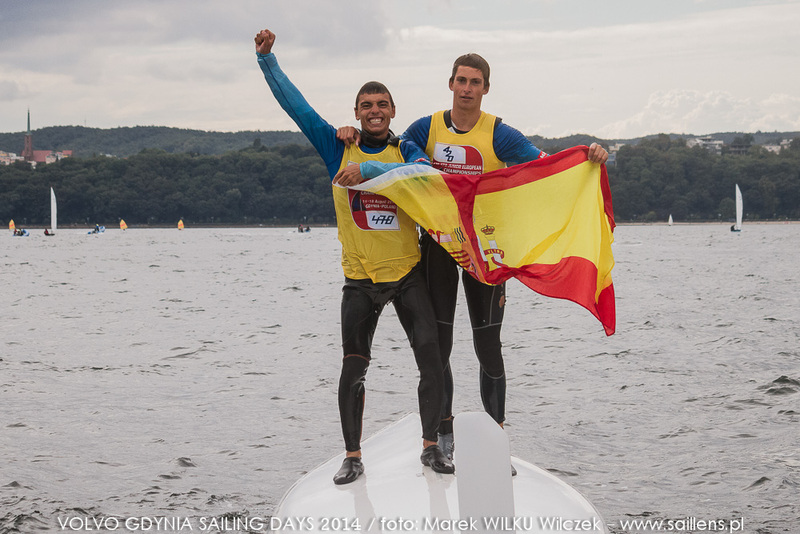 Formerly both helms, at last year’s Junior Europeans they faced each other on the race track, but since pooling skills their performance has escalated. 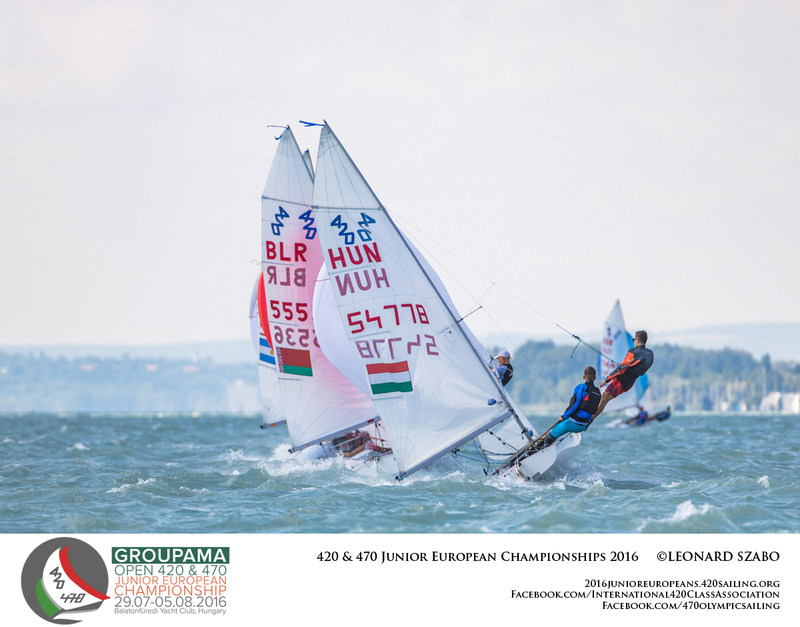 They finished 28th at last month’s 420 Worlds, and clearly prefer the specialist lake conditions. Israel’s Ido Bilik/Ofek Shalgi (ISR) step up to third. 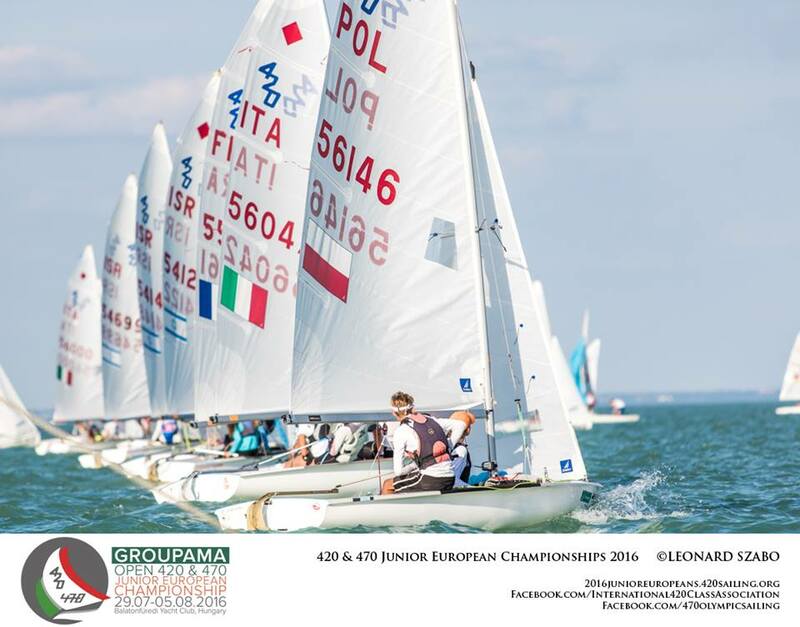 The pair won the U17 fleet Junior European Championship last year, and now contesting the U19 fleet are again well up in the fight for a podium finish. 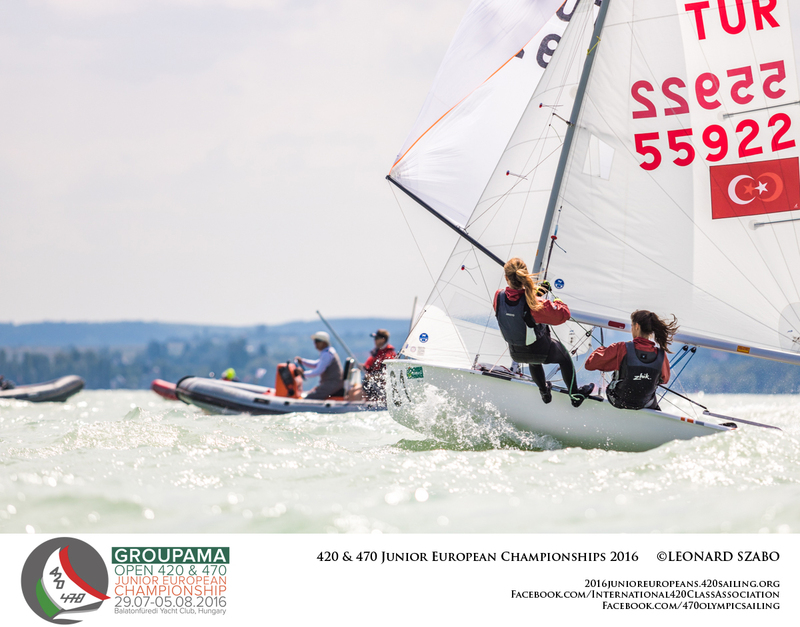 Top girls team are Julia Szmit/Hanna Dzik from Poland who finished 5th at the 420 Worlds, picking up top junior and U17 crowns along the way. 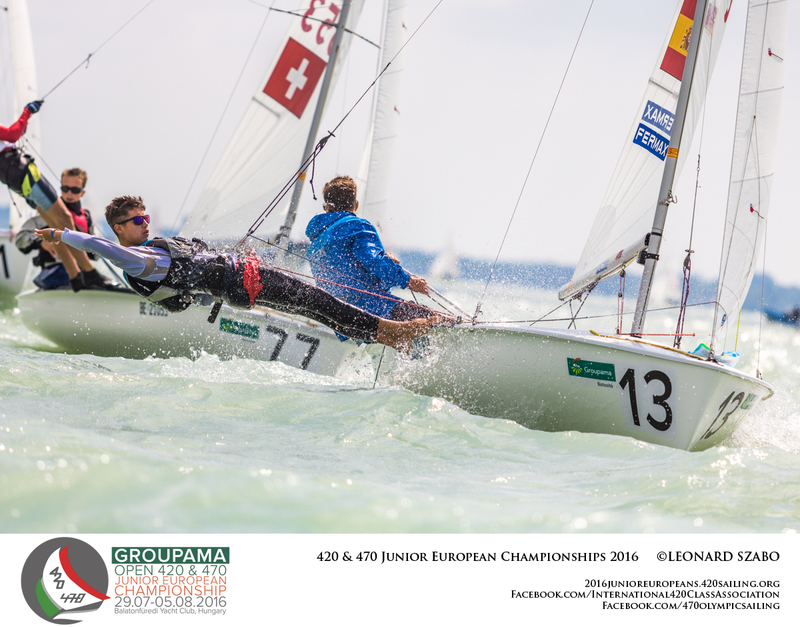 Racing in an open fleet at the Junior Europeans, they continue to be right in the fray, already achieving a huge upgrade from their 38th place result at last year’s Championship. In the past eight months, this hugely successful partnership has won the ISAF Youth Worlds in Malaysia and secured their place on Poland’s Youth Worlds team for a second year, and will be heading to Auckland in December 2016. “It is harder for us as the boys are stronger and bigger, but we are doing well,” said Dzik. “We are good friends, and a good team, so it is fun,” added Dzik on her longstanding friendship with Dzik in the Optimist Class, before they stepped up to the 420. “We are really enjoying the weather and the atmosphere here. 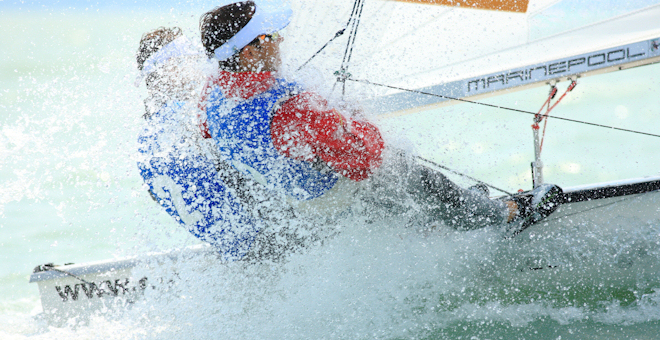 We like the conditions on the water, so all is great." They are aiming for a top ten finish as a minimum standard in this open fleet, but the main target is to secure the Ladies European Championship title. So far, they are right on track. The 420 Open fleet has now completed their qualification series, and advance to the 6 race final series from Tuesday 2 August. Tuning is all about finding those magic “go fast” numbers, and the top two placed teams certainly found magic on the race track today. The first and second placed teams going into today switched positions by the end, with Tommaso Cilli/Bruno Mantero (ITA) edging ahead of Germany's Daniel Göttlich/Linus Klasen by 1 point. More importantly, these two teams have now separated themselves from the pack, with an 18 point advantage between 2nd and 3rd. Not an insurmountable lead, but judging on performances so far, it will be hard for the chasing pack to break them down. A cracking day from Great Britain's Vita Heathcote/Milly Boyle, claiming both wins and accelarate up the leaderboard to third, ranking as the top placed girls team. The 420 fleets will each contest 3 races, with a scheduled warning signal of 0955 hours, starting with 420 Open Gold, 420 Open Silver and then U17. Two races for the 470 fleets, with the 470 Men Gold racing first, then 470 Women, and then 470 Men Silver, with a scheduled warning signal of 0955 hours. We will be bringing you updates from the racing action via our Live Race platform available on the homepage and Live Race page. 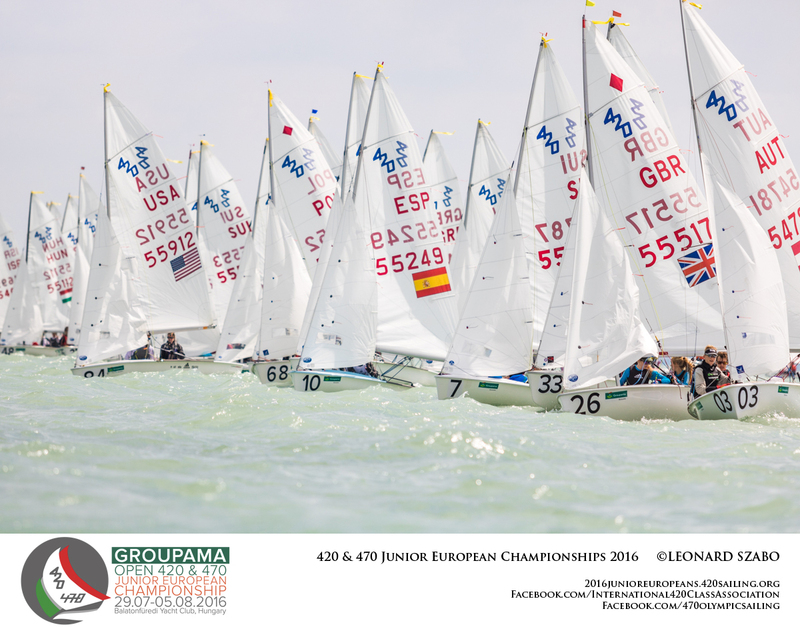 You can also get updates from the 420 Class on the go with the 420 Junior Europeans Championship APP. Daily photos are available on the Championship gallery and 420 and 470 Facebook pages.